Here is a press release from Tim Ferry announcing his retirement. Tim has a bit of a special connection with New Jersey. As a privateer, early in his career Mike Rossini of RRP took Timmy under his wing and helped shape his career. He raced many times at Raceway Park and even came back as a Kawasaki Factory rider to do exhibitions and sign autographs for his fans. 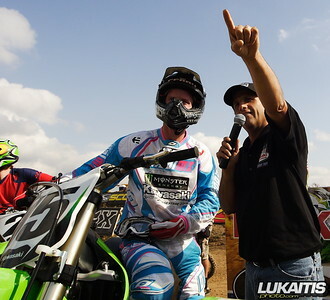 Ferry will certainly be missed on the National and Supercross tour. Good Luck to Ferry in all of his future endeavors. Former Factory Kawasaki, Yamaha and Suzuki rider Timmy Ferry announced today that he’s retiring from professional motocross effective immediately. Ferry has been trying to recover from a broken heel suffered at the 2009 Daytona Supercross and although he came back to race last summer, the injury lingered and prevented “Red Dog” from riding to the best of his ability. 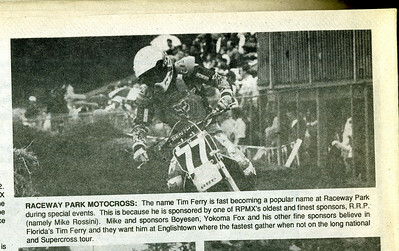 With a professional career that started in 1991 as a multi-time amateur champion, Ferry has certainly left a mark on professional supercross/motocross with the 1997 125 East Coast Supercross championship, a 3-time member of Team USA at the Motocross des nations, two 125 supercross wins, four AMA motocross national wins, an AMA rookie of the year award in 1992 and the top privateer award in supercross in 1999. Having achieved a career that spanned so long and produced so many wins and podium finishes certainly makes it easier to accept retiring for the 35-year old Ferry. “I can’t believe that I’ve been able to do as much as I have in the sport and I’m grateful for all the fans that cheered me on over the years as well as the relationships that I’ve made. Everything I have in my life has been because of motocross and even though I feel like I’m ending my career a little prematurely, I have no regrets with how everything has turned out” said Ferry.